Call recording function is an important part of voice communication services. Call recording is critical for customer services as recorded calls could be used for quality assurance, training purpose etcetera, or for evidence when required. A recorded call is an audio recording of a telephone conversation between a caller and a callee. There are telephone recording laws. Depend on the law of a country or a state, call recording may require one-party consent or two-party consent. In the United States, federal law requires that at least one party taking part in the call must be notified of the recording. That is the reason why we might have heard notification messages every time when making a phone call to our bank, insurance, governmental services etc. Often, the notification message itself is also included in the recorded call as an evidence of the consent. 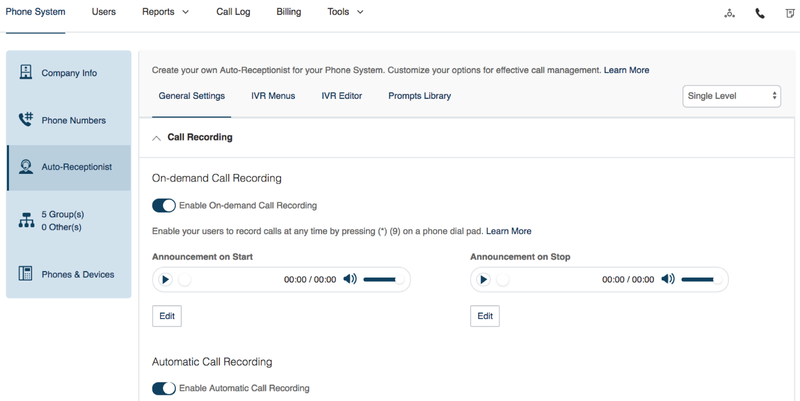 Automatic call recording: An account administrator can easily enable automatic recordings for inbound and outbound phone calls for users under that account. On-demand call recording: When the on-demand option is enabled, during a call, we can simply press *9 to begin recording, then press *9 again whenever we want to stop recording. It’s even more convenient on the RingCentral mobile phone app or on the computer soft-phone app, which lets us simply click the Record button to start recording, then click the Stop button whenever we want to stop recording. The notification messages for starting and stopping a call recording can be customized to meet a company’s policy. 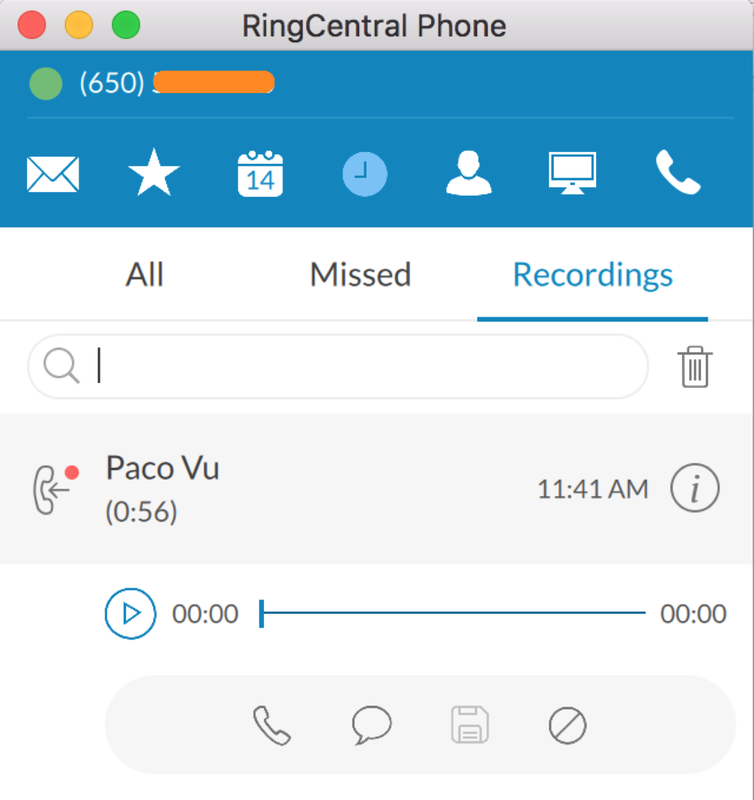 Recorded calls from RingCentral voice service can be accessed via the RingCentral phone for mobile or from the RingCentral soft-phone on a computer. We can easily playback or pause a recording, scrub the progress bar to fast forward or rewind while listening to the recorded conversation. The tools bar below each recorded call allows us to call back or reply with a text message. We can also save a recorded call to a local folder or block the number just with a click on an appropriated icon. Also, recorded calls can be accessed via the RingCentral account service dashboard under the call-log tab. Alternatively, recorded calls can be accessed programmatically using the call-log API. We can take advantage of the API capability to access recorded calls more effectively. For instance, we can access the audio content of a recoded call, transcribe the recording and analyze the conversation to find critical subject and make alert accordingly. Or we can index all recorded calls’ transcripts and make it searchable. 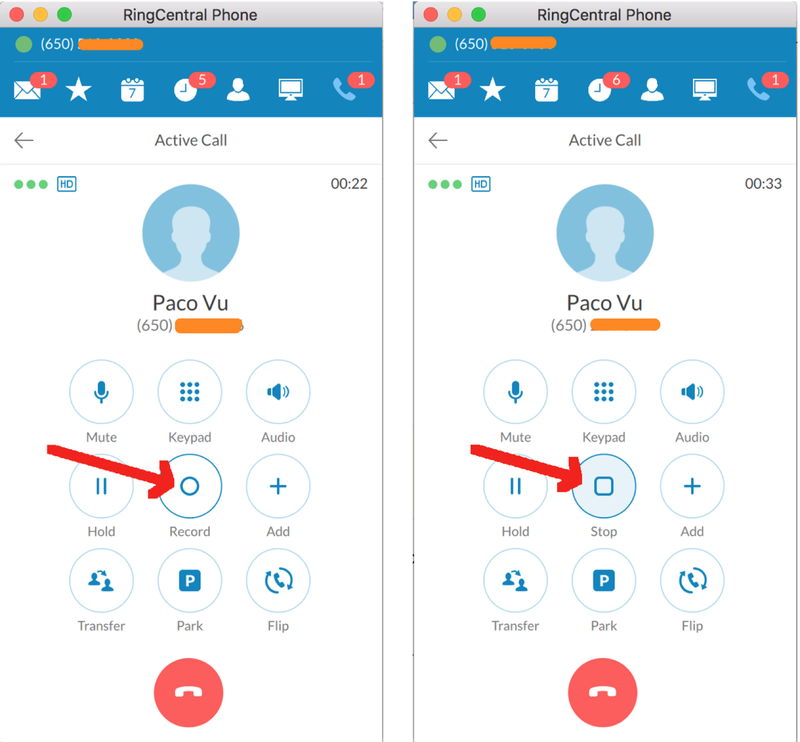 How can I access RingCentral recorded calls programmatically? Call recording metadata is part or the generic call log data. Thus, they are stored under a RingCentral account’s call log database. The API endpoint above lets an admin user access the entire company’s call log metadata logged for the past 24 hours. The API endpoint above lets a user, identified by the extensionId, access his/her own call log metadata logged for the past 24 hours. “recordingType” specify the type of call recordings as Automatic or On-demand call recordings. Or as All to read both Automatic and On-Demand call recordings. “dateFrom” and “dateTo”: specify the start and the end date and time for fetching call history which were logged within that period of time. For example, making a GET request to the API endpoint below lets a user, identified by the extensionId to access his/her own recorded calls’ metadata logged for the whole month of March 2018. What information can I get from the call recording API? “direction” is the direction as Inbound or Outbound of a voice call. “duration” is the call duration in seconds of an entire call. This is not the duration of a call recording! “from” contains the caller’s phone number and name (if existed). And other information such as the location (city, state) if it can be determined from the phone number. “to” contains the callee’s phone number and name (if existed). And other information such as the location (city, state) if it can be determined from the phone number. “startTime” show the date and time when a call/fax transaction has been made. “uri” the URI pointing to a call recording metadata resource. “type” identified if a recording was recorded automatically or by on-demand. “contentUri” the URI pointing to a recorded call binary content. How can I access a recorded call binary content? Once we have a recordingId of a call, we can also use the Call Recording API to get the metadata which includes the contentType and the duration of that particular recorded call. Assumed that we already had an app created under our RingCentral developer account and we‘ve got the app credentials in place (if not here is the 3 steps to create one). Our app’s platform type is a “Server-only (No UI)” and it must have the ReadCallLog permission so we can access the call log. Let’s first import the RingCentral SDK and other dependencies including the IBM Watson library. Then get the platform instant so we can use it to call RingCentral APIs. Then we create a sqlite table for saving call recording metadata later. Now let’s implement an engine which helps us login to RingCentral platform and make APIs call to read call recordings, parse the response and save some metadata to our local database. The engine also includes a function transcriptCallRecording which invokes the watson.js module and call IBM speech-to-text API to transcribe a recorded call. Once we get the transcript of a recorded call, we will update the recorded call metadata from our local database with the text and that would make it possible to search for spoken words from a recorded call. var audioSrc = "./recordings/" + req.body.audioSrc + ".mp3"
errorRes['calllog_error'] = "You do not have admin role to access account level. You can choose the extension access level." errorRes['calllog_error'] = "Cannot access call log." Hope you enjoy your reading and find the Call Recording API useful for your business. Meanwhile, stay tuned for more up coming API spotlight blogs.